Are you ready for a mesmerizing experience in Ibiza? 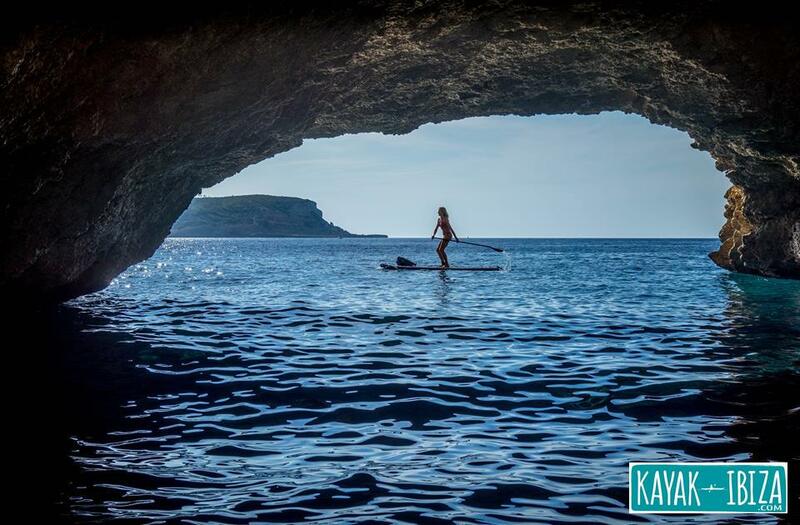 Join our SUP Expeditions and discover Ibiza’s stunning coastline from the SUP. Enjoy with us its pristine crystal-clear waters, gorgeous coves, islets, rock gardens, cliffs, caves & wildlife in a one-day-long SUP adventure. We offer different mind-blowing itineraries around the island paddling to the most legendary and unspoiled natural Ibiza´s treasures such as Es Vedrá, Tagomago & Conejera islands. For safety reasons, each SUP expedition’s itinerary will be announced one or days before the departure depending on sea, waves & wind conditions. Our SUP expeditions are focused to intermediate and advanced level paddlers who are able to paddle for 2-3 hours long distances, including short breaks to swim, snorkel or just chill out along our way. A minimum of 8 people is required per expedition. If your group is less than 8 pax, please check our events calendar to join one of our set expeditions (We will refund the amount of the booking if the minimum number of participants is not completed). Otherwise, if you are a group of 8 or more people, please get in touch with us so that we can tailor-made your SUP expedition meeting your requirements. As food lovers that we are and the awareness that we have about nurturing our body properly, our SUP Expeditions also include a delicious healthy meal designed by a Mediterranean food chef who will delight us with a variety of fresh salads, fresh fruits, nuts, delicious homemade spreads and savoury cakes, all made with local high-quality products. You will be surprised to find out that it’s not just a meal for the expedition, but a part of the expedition to enjoy itself!. Please note that we also cater for special diets and food-allergies, if you have any special food needs just let us know in advance, thank you! On the date of the expedition, we will meet up at our departure location at 10:00am to check you in and provide you with your SUP gear. After checking in, we will present an introduction of our SUP expedition itinerary together with a short review of the proper SUP touring technique and a few tips for our adventure. Once in the sea (at 11:00 am approx) we will start discovering Ibiza’s coastline paddling for 2-3 hours approx. (including short breaks to swim, snorkel or just chill out along our way) until stop for our lunch break (one hour break). After lunch, we will continue enjoying the amazing scenery from our SUP boards while we paddle for another 2-3 hours approx. (including short breaks). Once at our final destination, our SUP & SUP Yoga qualified instructor will guide you in a 30-45 mins stretching & unwinding session either at the beach or on the SUP board to recover & relax your body from all the great workout that you did… surely the best way to finish our adventure! We SUPply all the SUP gear, insurance, licences, support boat (you are welcome to rest and take a break on the boat whenever you need during our expedition), nutritious & healthy food by local chef, drinking water, and our best qualified and certified SUP instructors & guides who will take care of you and provide you with an unforgettable experience. – Sunglasses/ sun hat (if you need them, we recommend not taking them on the SUP in case you drop them in the water). – Lycra or Long-sleeved shirt in case it gets chilly during the SUP expedition or after.